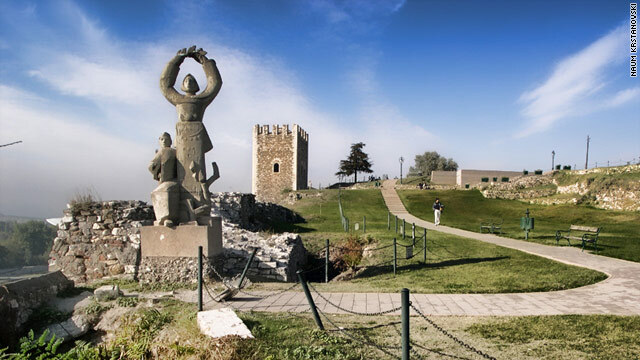 A statue presides over Kale fortress enjoying the highest vantage point in the Macedonian capital of Skopje. CNN's new series i-List takes you to a different country each month. In May, we visit Macedonia, focusing on changes shaping the country's economy, culture and its social fabric. (CNN) -- Housing over a quarter of the country's population, Skopje is Macedonia's largest and most diverse city. With a long history marked by Roman, Byzantine and Ottoman rule, the region boasts a wealth of ancient sites and intriguing relics. But the Macedonian capital is also a youthful and modern city. European-style bars and cafes are in abundance, while swanky shopping malls draw buzzing crowds. The city's mix of traditional and contemporary eateries mirrors its proud heritage as well as its modernizing aspirations. Here we provide a brief travel guide to this under-explored gem in the heart of the Balkans. To get an immediate flavor of the Macedonian capital's rich history head to the Kale Fortress in Skopje's old town. Originally built by the Byzantines in the sixth century and featuring 121 meter long stone walls, Kale occupies the highest point in the city -- making it a very rewarding spot for sightseers. The theatrical fortress also hosts outdoor drama performances in the summer. 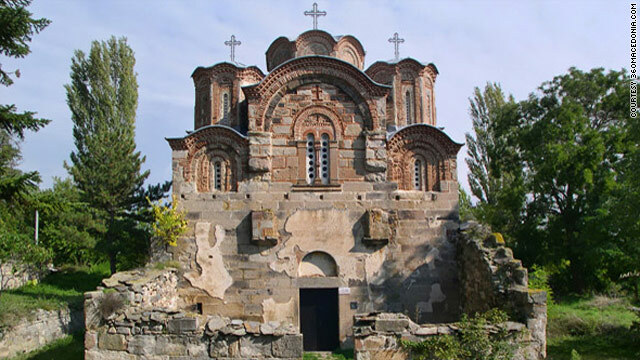 Those interested in Skopje's religious heritage must visit the St. Pantelejmon Monastery. A 15-minute drive from downtown Skopje up on the forested slopes of Mount Vodno, the 12th century monastery boasts some of the most emotionally expressive examples of Byzantine art in existence. St. Pantelejmon also contains a restaurant in its court-yard, serving authentic (if a little expensive) Macedonian cuisine cooked up by the inhabitant monks. If you've had enough history for one day and you happen to be visiting in the last few weeks of October, then the Skopje Jazz Festival is a no-brainer. Running since 1982 and considered by many to be one of the best international jazz festivals in Europe, performers have included blues legend Ray Charles, African kora star Mory Kante, and Cuban diva Omara Portundo. 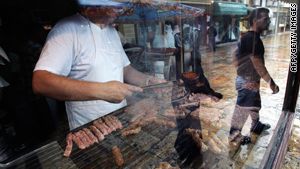 A cook grills meat balls in a restaurant at Skopje's old bazaar. For a romantic atmosphere on a budget, the Ezerce is a grand pavilion-style restaurant hidden inside the inner city-oasis of Skopje's Gradski Park. An outdoor terrace is unleashed in the summer months, when live traditional music and cabaret are also on the menu most nights. The food is a mix of Macedonian and international flavors. Located in Skopje's historic quarter, Beer House An enjoys a very popular reputation for it's traditional daily specials and its thoroughly ancestral feel. Housed in an authentic medieval inn, the bare brick walls are decorated with icons, old plates and antique weapons. The restaurant's branding as a 'beerhouse' belies its excellent food -- the 'pasha' (spiced) meatballs and stuffed vine leaves come highly recommended. Those keen to 'live like the locals' should keep an eye out for Skopje's numerous "kafanas". The Macedonian equivalent of an old-fashioned British pub, these taverns offer cheap and cheerful local grub, often accompanied by the lively swing of traditional Balkan folk music. Visitors exhausted from all the regional fare, who crave something a little more western, could do worse than the Taverna Toscana. Tucked behind a big supermarket in town, this is a little slice of Italy that serves the familiar Mediterranean line-up at a reasonable price. 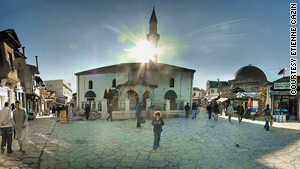 With its copper-domed bathhouses and Ottoman trading inns, the Turkish quarter is one of the oldest parts of the city. The Turkish Bazaar or "Carsija", found in the old part of the city, shows off some of the most wonderful specimens of municipal Ottoman architecture in the Balkans. The vast majority of the capital's jewelers are centered here in a section known as Charshi (meaning "marketplace"). Sunset-hued pink and deep red cloths are on display, alongside shiny copperware and rich textiles. Tailors, cobblers, tinsmiths and all manner of craftsman offer their services, while tea-rooms and food-stands provide the ammunition that sustains the market's vibrant atmosphere. Back in the center of Skopje is the Gradski Trgovski shopping mall, a modern, three-story consumer paradise that also functions as a popular meeting point for many of the city's young. A great place to find ultra-cheap deals on everything from clothes to groceries. Jugotone's music shop on the third floor has a great variety of hard to find ethnic-rooted sounds. If Gradski Trgovski is a bargain basement for all the essentials, then the recently-opened Ramstore is its shiny upmarket sibling, packed with trendy bars, eateries and boutiques. 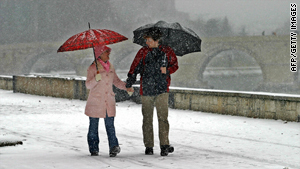 A couple is strolling on the embankment of the river Vardar, enjoying the snowfall that turned the city white. The coffee shops and bars near or along the quay of the Vardar River are constantly brimming with activity, especially during summer evenings. Many of the places here have a modern, European feel with plenty of outdoor patio space, and tend to attract a young cosmopolitan crowd. Around here, St. Patrick's -- an Irish pub serving proper Guinness -- is a surprisingly popular watering hole. However, visitors craving something more unexpected should seek out New Age, a big garden shed converted into a coffee shop, hidden down an unsuspecting dead-end street near Skopje's largest Catholic church. Wobbly wooden furniture, chess-boards and plump cushions adorn this Hobbit's cove of a cafe, where patrons can choose from over 38 varieties of herbal tea. Skopje has a very young population, and so it's no surprise that nightclubs are aplenty. Many of the clubs are in the heart of town and choosing a venue depends on musical preference, but if you've got your all-night raving shoes on then the vast Colosseum, usually playing house, techno and trance music, is the place to be after midnight. Have you visited Skopje or do you live there? Post your travel tips in the comments section below or share your experiences on iReport for our Macedonia special.